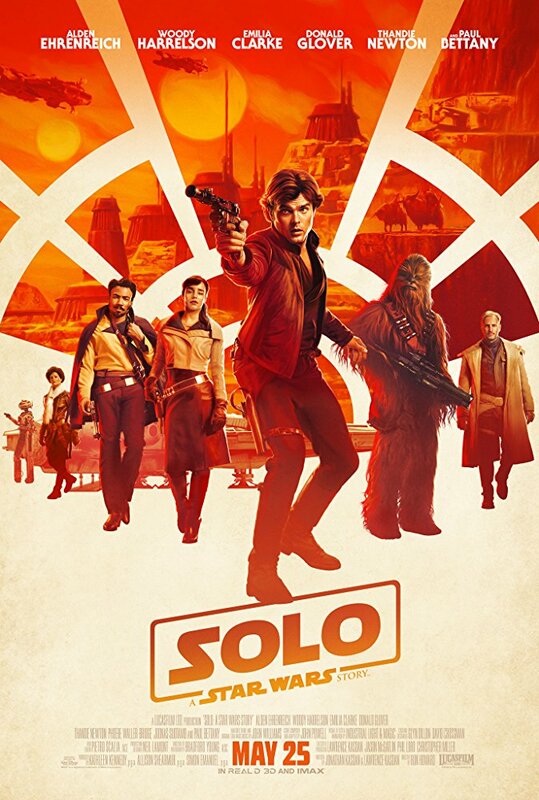 Plot: Through a series of daring escapades deep within a dark and dangerous criminal underworld, Han Solo meets his mighty future copilot Chewbacca and encounters the notorious gambler Lando Calrissian, in a journey that will set the course of one of the Star Wars saga’s most unlikely heroes. It’s okay Starts out fairly boring and is as a whole a kinda forgettable film, But Solo still has plenty of this to like about it. An absolutely terrific Star Wars movie, “Solo: A Star Wars Story” absolutely blows away the extremely dissapointing “The Last Jedi”. Director Ron Howard does a perfect job of balancing nostalgia and non-stop action and fun. Acting is excellent across the board and technical crefits are all first rate. The best movie of the year so far. Star Wars fans should put "Solo: A Star Wars Story" on their list of movies to see this summer for two reasons: it’s a Star Wars movie and Chewbacca is awesome in it! And by awesome I mean that Chewbacca (Joonas Suotamo) kicks the crap out of his enemies with vigor and vengeance never before displayed in any of the previously released Star Wars movies. Alden Ehrenreich cannot be Harrison Ford and Donald Glover cannot be Billy Dee Williams, and no one in their right mind would ever demand such an unreasonable request of either one of them. But what both Ehrenreich and Glover can be is a new start to a familiar duo, and take Han and Lando on more entertaining adventures for us all to enjoy in the future. And what can be so bad about that? "I have a good feeling about this!" The galaxy's most infamous smuggler gets the origin story treatment in this slick action packed adventure. Director Ron Howard not only managed to make a fun movie out of a notoriously troubled production but add further depth to Star Wars' most popular character-after Darth Vader. Alden Ehrenreich is a natural fit for a younger Harrison Ford while Donald Glover nearly walks away with his smooth impersonation of Billy Dee Williams. This pair of promising young actors are bolstered by strong supporting work by Woody Harrelson, Thandie Newton, and Paul Bettany. If there is a weak link among the cast, it's Emilia Clarke in the thankless role as the love interest. She does some interesting things in the end but it's too little too late by that time. “It's risky, but it's worth a try”. Even before the camera’s began rolling, this movie was met with trouble. You probably heard all about the behind the scenes drama - If not, basically Phil Lord and Christopher Miller were attached to direct, but got fired halfway through shooting, because I’m guessing Lucasfilm had no idea these guys are best known for making comedy movies, even though you hired them to add ‘a comedic touch’. Lord and Miller were replaced by Ron Howard. An acting coach was called on set for Alden Ehrenreich who’s playing Han Solo, as he was struggling to capture the spirit of Fords iconic character. Michael Kenneth Williams role was removed from the final film and new characters added in. No posts have been made on this movie yet. Be the first to start talking about Solo: A Star Wars Story!